Welcome to Antares Ship Builders and Trade Speculators! You are part of the extended Wescott family. We are a family-owned business established in 540 by Broderick Wescott, and has been in the family since it was a single small merchant vessel, the Fair Wren. Since then, the company has grown to its current state of over 18,000 employees and dozens of vessels plying the space lanes. You are now a part of this proud history. Starting with that single ship, Broderick went from a scrappy free merchant to creating the start of a trading empire, Antares Trade Speculators. Using brokers on various systems, Broderick was able to procure better cargos than his competitors, as well as establishing standardized routes with the assistance of local governments to ensure timely delivery of goods and mail. To help off-set the immense costs of purchasing ships, he started the Antares Shipyards on D’Arlee in 572 by the purchase of a small ship building firm. This small ship yard went from producing perhaps 5 ships a year to more than 20 ships. Not all went back into the business, and as a result, we were renamed to Antares Ship Builders and Trade Speculators. Over the years, Antares built itself recognition as a stable, dependable partner for world governments and private organizations. With its expanding fleet of small merchant ships, Antares covered areas that larger shipping companies wrote off as too small for a profit. We not only deal with world governments and interstellar corporations, but we also specialize in the handling of the personal and small local companies. We were fair trade before fair trade was born. Antares gained Imperial recognition in 761, three years after D’Arlee joined the Imperium. 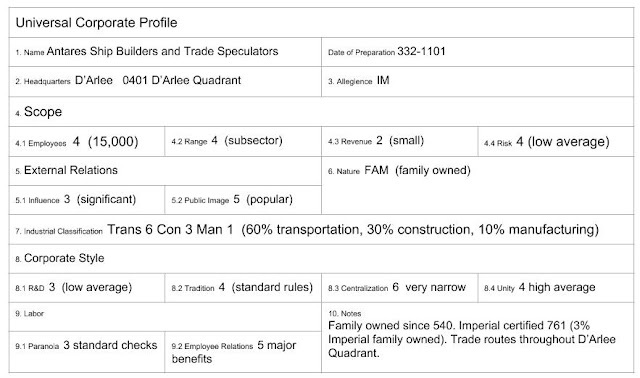 At that time, in order to expand into Imperial trading relationships, the Imperial family has a 3% stake in Antares. 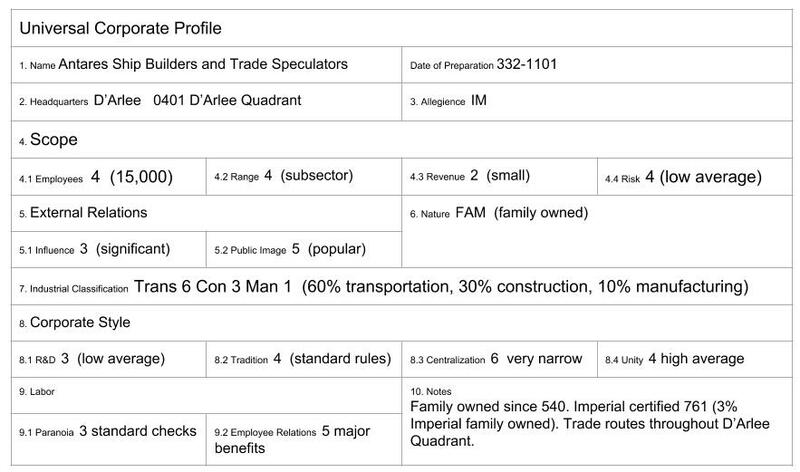 See Appendix 3 for the current stock ownership. With the growth of the Imperium, Antares faced larger challenges are larger corporations moved into our traditional routes. Additionally, other ship building corporations, with vastly larger resources, moved in. Antares in the intervening 300 years was slowly reduced in size from its peak of more than 50,000 employees and 100+ ships. Our mission also changed to reflect the changing of the times. Rather than building ships and hiring crew for 100% of our trading needs, we started the owner-operators initiative. In 1002, we started chartering ship owners for a portion of their profits. We invested in people. We now support dozens of owner-operators in addition to our existing fleet. Antares hires at current Imperial standard rates for the various positions required. Certification levels can boost the base pay. Additionally, ship owners working for Antares gain a 10% discount on yearly maintenance at any appropriate Antares shipyard (see Appendix 2 for current ship yard locations and capacity). Owners are given access to Antares brokers (see Appendix 2A for current broker listings) for a reduced fee. Owners agree to a 5% net profit dividend to be payed to Antares in exchange for these benefits.